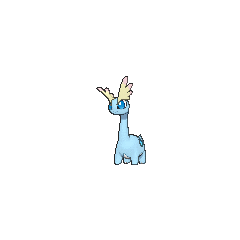 Amaura in game: 5,011 Who? Important notice! 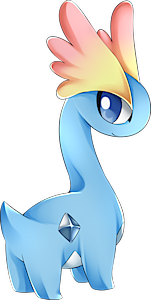 Pokemon Amaura is a fictional character of humans. Amaura (Japanese: ???? 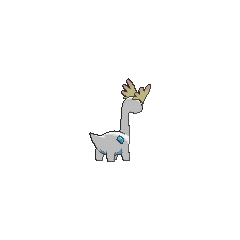 Amarus) is a dual-type Rock/Ice Fossil Pokémon introduced in Generation VI. Amaura is a calm creature that lived long ago in a cold land without violent predators. 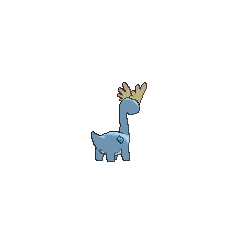 It is a quadruped, dinosaurian Pokémon similar to sauropods. It has a long neck and a short, stubby tail. Above its large, deep blue eyes are two sail structures, which are yellow at the bottom fading into pink towards the tips. These sails have an iridescent appearance. Additionally, the sails change colors to reflect Amaura's mood (green when happy, blue when sad, and red when angry), as seen in Pokémon-Amie. It has a light blue body with a white belly. A single dark blue crystal adorns each side of its body; these crystals permanently remain at freezing cold temperatures, as demonstrated in Pokémon-Amie, where the crystal freezes the hand that touches it. While its forelegs lack claws or digits, the hind legs each have a single white nail. As shown in the anime, Amaura have the ability to compose auroras. Amaura made its debut in Coming Back into the Cold! alongside its evolution. Both Pokémon were brought back to life after being found frozen in ice. The same Amaura appeared in a newspaper in To Find a Fairy Flower!. An Amaura appeared in Pikachu, What's This Key?. An Amaura appeared in Volcanion and the Mechanical Marvel. 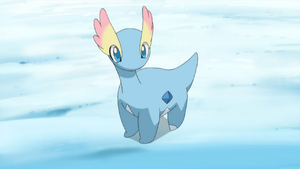 An Amaura appeared in Diancie and the Cocoon of Destruction. 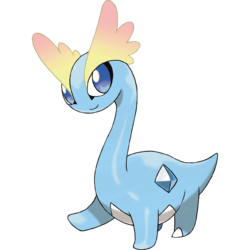 Amaura is based on a young Amargasaurus, which were speculated to have skin sail extensions on their vertebral spines. It also shares traits with various species of Diplodocoidea. 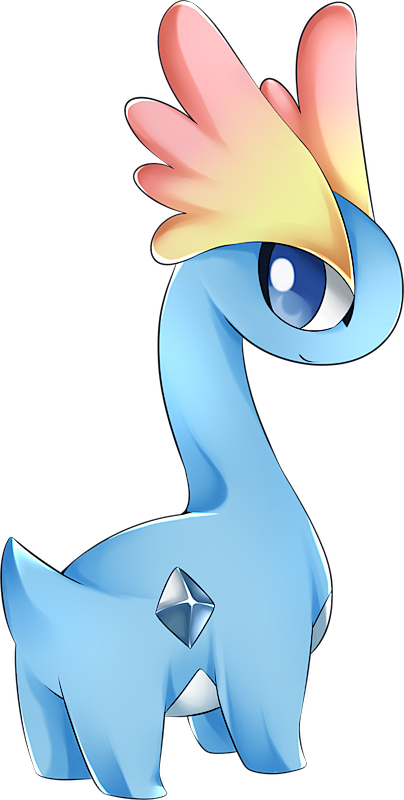 The color-changing sails upon its head are also based on auroras, most like aurora borealis due to its partial Ice typing.